WORLD first, Australian made AI is making waves in the tech circuit as a reliable assistant in search and rescue operations and it could be the solution needed to replace controversial shark nets used at some east coast beaches in the future. The lifesaving technology — SharkSpotter — is being used in the Westpac Little Ripper Lifesaver ‘smart drone’ to monitor Australian beaches from the sky and it’s able to find a needle in a haystack. Thanks to SharkSpotter, the drone is able to pinpoint the location of sharks and other marine life, at-risk swimmers and beach hazards in real time while watching from the sky. With 90 per cent accuracy, it has already been successful in assisting with surf rescues and patrols by being able to detect dire situations and quickly assist those in distress. While the goal of SharkSpotter is to prevent beachgoers from shark attacks, the experts behind it believe it could be a solid alternative to shark nets used in Queensland and NSW. The nets have sparked outrage among marine conservation groups and beach communities after NSW Department of Primary Industries data showed a grim result for turtles, dolphins, rays and other “non-target” marine animals that died as a result of being caught in nets between November 2017 and May 2018 off the NSW north coast (Lennox Head, Ballina and Evans Head). One hundred and forty five animals were caught in this net trial and 143 of those were “non-target” animals. Only 86 of those were released alive. The nets intend to catch great white, bull sharks and tiger sharks but only caught two target sharks during this period. The data led to the state government deciding not to reinstate the nets on the north coast. Responding to the data at the time, Ballina Council Deputy Mayor Keith Williams said the shark net trial was more “slaughter than science” and felt it clearly indicated drones and SMART drumlins were far better at protecting beachgoers from shark attacks. The SharkSpotter could help this argument. So far its use in the smart drone is being used on 15 Australian beaches across Queensland and New South Wales and it’s helped more than 50 people in the past year. It’s hoped it will be used nationwide within the next year. The AI came to life when those behind the Westpac Little Ripper asked University of Technology Sydney researchers to help in their quest to reduce shark attacks on humans. Westpac Little Ripper General Manager Ben Trollope said SharkSpotter has greatly improved lifesavers’ ability to monitor beaches and identify risks at sea. “I know first-hand what it’s like trying to find someone in a vast ocean,” he said. Flying 60m above sea level the SharkSpotter is able to pick up what’s under the sea to about 2m deep and scan a radius of about 100m at a time. When used with the Westpac smart drone it can be flown for just over 20 minutes and is able to dispatch rescue aids in just over a minute. In January the smart drone completed the world’s first surf rescue by drone in Lennox Head, NSW — saving two men who came into strife while swimming. “It’s the difference between life and death,” Mr Trollope said, saying all-terrain vehicles tested against the smart drone took up to four minutes to do the same job. The SharkSpotter aerial surveillance technology has already gained international fanfare and recently snapped up Australia’s iAward for Artificial Intelligence or Machine Learning innovation. SharkSpotter team leader Professor Michael Blumenstein said the technology issues an alert when a threat is detected — in the case of beach safety it would be a shark, a rip or human at risk of drowning. “It’s able to tell the difference between sharks, 16 other categories of marine life and humans,” he said. While SharkSpotter has only been deployed on beaches at this stage, the scope for it to be used in other rescue and high risk operations is vast. Professor Blumenstein said it could be applied to land searches for missing persons, assist in police chases, crocodile detection, day-to-day security operations and more — not bad for a technology that took under two years and under 10 people to create. He said the technology could detect both moving and stationary objects so it would also work in finding an injured or deceased person or marine life trapped in a shark net. It can also be synched up with other drones to scan larger land or sea areas. For Professor Blumenstein and his research team, the SharkSpotter is a win after decades of working out how to make Australian beaches safer. “We’re excited as we’ve been able to develop technology that’s been able to save lives,” he said. 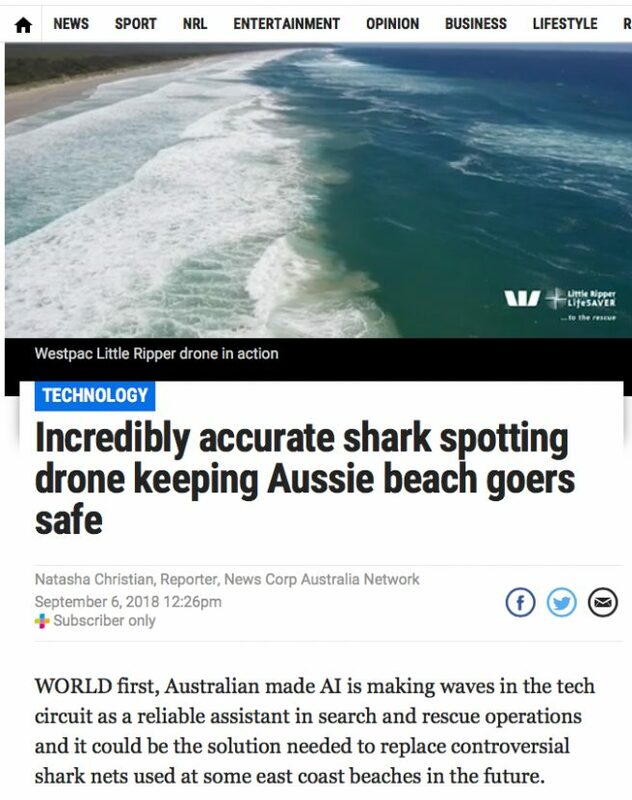 Now the mission for Mr Trollope and Professor Blumenstein is to get more SharkSpotter equipped smart drones keeping an eye on Australian beaches. They also expect it to gain further worldwide attention when it represents Australia in the international iAwards in China next month. Regardless of the result there, the SharkSpotter and its use on lifesaving drones is considered a win in terms of AI and how it can be used to improve human lives.